The Royal Meteorological Society recognises excellence in meteorology and related disciplines through its medals, awards and prizes. Listed below are all of the Society's awards and prizes including past winners and some information for each award. The call for nominations for the Society's 2018 Awards and Prizes is now closed. 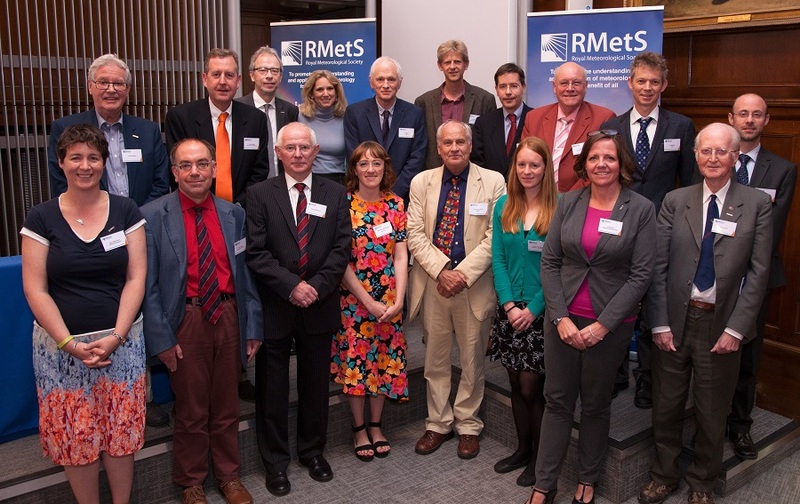 If you would like to know more about submitting a nomination for the 2019 Awards, please contact info@rmets.org. 1. The Symons Gold Medal is one of the Society’s most prestigious awards, awarded biennially for distinguished work undertaken in connection with Meteorological Science. 2. The Buchan Prize is awarded annually to members of the Society for a paper or papers published in the Society’s journals in the preceding five years and adjudged to contain the most important original contribution or contributions to meteorology. 3. The Hugh Robert Mill Award is awarded biennially for original research into the distribution of precipitation, or into the variation of precipitation in time at any place, or into precipitation either as a meteorological phenomenon, or in relation to climatology, agriculture, water supply, water power or other applications. 4. The Michael Hunt Award is awarded biennially to individuals for excellence in increasing the understanding of meteorology or its allied disciplines among members of the general public, such as yachtsmen, schoolchildren, etc. 5. The LF Richardson Prize is awarded annually for a meritorious paper published in the preceding four years in a Society journal by a member of the Society who is an early-career scientist (no more than 15 years into their career, excluding career breaks). Please note if the nomination is for the LF Richardson Prize then clarification of the work of the person nominated is required and confirmation that they did most of the work for the paper being nominated. 6. The Adrian Gill Prize is awarded annually to a member of the Society who has made a significant contribution(s) and author paper(s) in the Society’s journals in fields interfacing between atmospheric science and related disciplines, thereby being referred to as “multi-disciplinary”. 7. The Climate Science Communication Award is awarded annually in recognition of outstanding scientific contributions to Climate Science, including proactive outreach activities. 8. The Innovation Award is awarded biennially to recognise people, projects or programmes within the academic, scientific or business communities making significant contributions to educating, informing or motivating organisations in their response to meteorological challenges. 9. The Vaisala Award is awarded biennially to recognise people or teams from within the amateur community, academia or business making significant contributions to instrumentation or observing across the meteorological and related sciences. 10. The Society Outstanding Service Award is awarded annually for outstanding service to the Society by its members or staff. 11. The Gordon Manley Weather Prize is awarded annually for any outstanding contribution to Weather through a paper or papers or service to Weather in the preceding five years that have furthered the public understanding of meteorology and oceanography. Honorary Fellowship is a lifetime accolade made to a select group of distinguished individuals whose careers in meteorology (or a related science) or as a public figure renders them a leader and role model within the meteorological community and an inspiration to future generations. Honorary Fellowship is limited to a small number of individuals and is the highest honour bestowed by the Society. A list of the current Honorary Fellows can be found here. Please send a completed Nomination Form* to the Chief Executive (chiefexec@rmets.org) by 19 October 2018. The Malcolm Walker Award which is bestowed annually to recognise and encourage emerging researchers who have brought new insights into an aspect of the environmental sciences, which includes elements of meteorology and/or oceanography. The application should demonstrate that the candidate has an understanding of the historical context of his/her research and is able to communicate their work to a diverse audience. Applications must be submitted using the Application Form* for this award. The application must be supported by the research supervisor(s) responsible for overseeing the work of the candidate which is to be considered for the award. *All forms are also available as Word documents in the 'Awards Resources' box on the right-hand side of this page. Here is a full list of the awards and prizes given by the Society. Clicking on the "Show all" link will reveal a list of the people who have won each award in the past. Sir John Mason generously funded an award for Fellows of the Society, known as The Mason Gold Medal. The medal ranks alongside The Symons Gold Medal as the premier award of the Society and is bestowed in alternate years to the Symons medal. The citation for the Mason Gold Medal is “For outstanding contributions to the understanding of the fundamental processes that determine the variability and predictability of weather and climate”. The medal is presented at an appropriate special event and consists of a lecture by the recipient known as The Mason Gold Medal Lecture. The first Mason Gold Medal was awarded in 2006 to Paul Mason. In 1901, in memory of George James Symons FRS a British meteorologist who founded the British Rainfall Organisation, a gold medal was established. The medal is awarded biennially for distinguished work in connection with meteorological science. A representation of the Tower of the Winds at Athens appears on the reverse side of this medal. The medal was designed by Mr Frank Bowcher of Chiswick and the dies for it were furnished and executed by Mr John Pinches of London. The medal ranks alongside The Mason Gold Medal as the premier award of the Society and is bestowed in alternate years to the Mason medal. Dr Alexander Buchan was a Scottish meteorologist and oceanographer and is credited with establishing the synoptic chart used in weather forecasting. The Buchan Prize was instituted to commemorate the amalgamation in 1921 of the Scottish Meteorological Society and the Royal Meteorological Society. The Buchan Prize is awarded annually to members of the Society for a paper or papers published in the previous five years in the Quarterly Journal, the International Journal of Climatology or Atmospheric Science Letters and adjudged to contain the most important original contribution or contributions to meteorology. Hugh Robert Mill was a British geographer and meteorologist who exercised a great influence in the reform of geography teaching and on the development of meteorology as a science. He was Director of the British Rainfall Organisation from 1901 to 1919, and Honorary Secretary of the Royal Meteorological Society from 1902 until 1907 when he became President. The Hugh Robert Mill Award is awarded biennially for original research into the distribution or variation of rainfall or its application to meteorology or a related science. The Michael Hunt Award, which commemorates the achievements of Michael Hunt who was a TV weatherman, is given biennially for excellence in increasing the understanding of meteorology or its applied disciplines among members of the general public, including particular groups (eg. school children, yachtsmen, etc). Lewis Fry Richardson was an English mathematician and meteorologist, who pioneered modern mathematical techniques of weather forecasting. The L F Richardson Prize is awarded annually for a meritorious paper which was published in a Society journal during the preceding four years, and was contributed by a member of the Society who in their early career in meteorology (which we define as no more than 15 years into their career, excluding career breaks) at the time of submission. The Adrian Gill Award, named after the Australian meteorologist and oceanographer, is awarded annually to a member of the Society who has made a significant contribution, in the preceding five years, in the specified fields, and who has also been an author of a paper(s) in the Society’s journals. The specified fields are those that interface between atmospheric science and related disciplines. These related disciplines include oceanography, hydrology, geochemistry and numerical methodologies. The Climate Science Communications Award is awarded annually in recognition of outstanding scientific contributions in the field of climate science and proactive outreach activities to communicate climate science. The Prize is awarded to a member of the Society who has made a significant contribution, in the field of climate science, and who has also excelled in increasing the understanding of climate science among members of the general public. The award is based around innovation in meteorology, with a particular focus on business and/or public impact. It recognises people, projects or programmes within the academic, scientific or business communities who have made significant contributions to educating, informing or motivating organisations in their response to meteorological challenges, for example climate change or significant weather events. This is awarded biennially in recognition of contributions from both the professional and amateur community and outstanding contributions to the work of national and international meteorological field campaigns. It may be awarded to those whose work does not naturally lend itself necessarily to publication in the scientific journal literature, but is of significant value to the science of meteorology. The Vaisala Award is awarded biennially to recognise individuals or teams within the amateur community, academia or business who have made significant contributions to the field of observation and instrumentation. In particular this award recognises: instrument development; collection and quality control of observations; insight into observing the weather/climate; or meteorological field campaigns. The Society Outstanding Service Award was first awarded in 1989. It is awarded annually to a member of the Society who has exceeded the normal bounds of their role to the great benefit of the Society. The Society's journal Weather was first publishing in 1946 when Gordon Manley was President of the Society and the journal benefited from his encouragement. The Gordon Manley Prize is awarded annually for any outstanding contribution to Weather through a paper or papers -- or other outstanding service to Weather -- in the preceding five years that has furthered the public understanding of meteorology and oceanography. The FitzRoy Prize is awarded for distinguished work in applications of meteorology or related sciences, especially if published in Society journals. For this purpose, “applications” shall be defined as “scientific, technical, commercial and administrative aspects from the point of view of the end user”. The main requirement is that the work is of use to meteorologists, users of meteorological products and those engaged in the dialogue between them. The Prize is awarded biennially. The International Journal of Climatology (IJoC) Prize shall be awarded annually to the author of a meritorious paper or papers, contributed to the Society and published in the IJoC in any of the five consecutive calendar years preceding the year of the award, or for an individual who has made an outstanding contribution to the work of the journal. In memory of Malcolm Walker (1942-2015), and in recognition of his outstanding lifelong support for the Society, his wide-ranging knowledge and enthusiasm for meteorology and oceanography, and his encouragement of others, an award called the ‘Malcolm Walker Award’ shall be bestowed annually, if appropriate. The award aims to recognise and encourage new environmental researchers from a wide range of disciplines. The award is for emerging researchers* who have undertaken their research in the UK and/or sponsored by a UK body. No-one shall be eligible for the award a second time. The candidate’s research should have brought new insights into an aspect of the environmental sciences, which includes elements of meteorology and/or oceanography. The application should demonstrate that the candidate has an understanding of the historical context of his/her research and is able to communicate their work to a diverse audience. Applications must be submitted using the application form for this award. The application must be supported by the research supervisor(s) responsible for overseeing the work of the candidate which is to be considered for the award. Candidates are encouraged to discuss their suitability for this award with their supervisor(s) as part of their career development. The award will be presented at the Royal Meteorological Society’s annual Student Conference where the successful candidate will be expected to give a plenary talk on their research, outlining its importance, historical context and demonstrating the ability to communicate their research to a diverse audience. The successful candidate will also be encouraged to submit a paper based on the award lecture for publication in one of the Society’s journals. A certificate will be presented and there will be a monetary prize. The Quarterly Journal Editor's Award shall be awarded annually to an individual or group of individuals who have made an outstanding contribution to the work of the journal and shall not be confined to members of the Society. No person shall normally be eligible for the award a second time and in any case not within five years. The Quarterly Journal Prize Reviewer's Certificate shall be awarded annually to an individual or group of individuals who have made an outstanding contribution to the work of the journal and shall not be confined to members of the Society. No person shall normally be eligible for the award a second time and in any case not within five years. The Atmospheric Science Letters Editor's Award shall be awarded annually to an individual or group of individuals who have made an outstanding contribution to the work of the journal and shall not be confined to members of the Society. No person shall normally be eligible for the award a second time and in any case not within five years. The Meteorological Applications Editor's Award shall be awarded annually to an individual or group of individuals who have made an outstanding contribution to the work of the journal and shall not be confined to members of the Society. No person shall normally be eligible for the award a second time and in any case not within five years.